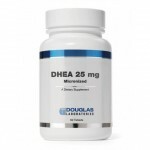 DHEA, dehydroepiandrosterone, is the most abundant adrenal steroid hormone in the body. After it is made by the adrenal glands, it travels into cells throughout the body where it is converted into androgens and estrogens. These hormones regulate fat and mineral metabolism, endocrine and reproductive function, and energy levels.